With the Scala, Skoda seems to be betting big on redefining the A segment of vehicles as the new hatchback promises to set new benchmarks among its rivals; international market launch in the first half of 2019. 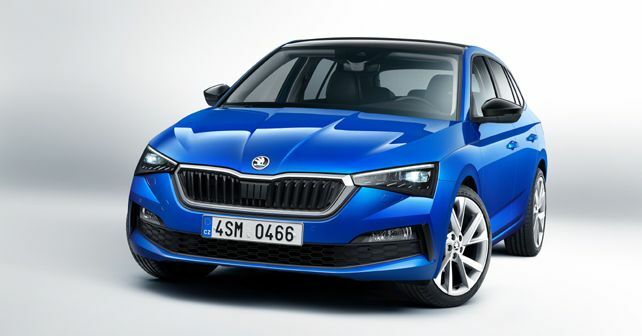 After presenting the RS version of its full-size Kodiaq SUV, Skoda has turned to the other end of the vehicular spectrum and has now unveiled its all-new compact car, the Scala hatchback. While the Scala represents numerous firsts for the Czech brand, the most crucial debut on the hatch is that of Volkswagen's MQB A0 platform, which currently underpins international VW models like the Polo and the new T-Cross. In terms of design, the Scala becomes the first production-spec Skoda model to feature distinct styling borrowed from the Vision RS concept, seen both on the outside as well as the interior. Some of the styling elements shared with the concept include an optional all-glass rear window, which replaces a more traditional tailgate. Further, the Scala is also the first model to feature 'SKODA' in block lettering across its tailgate instead of the brand's logo. The car measures 4,362mm in length and it sits on 18-inch alloy wheels. As mentioned above, the Scala features an all-new interior inspired by the Vision RS concept. New materials like a microfibre fabric for the seats and foam-cushioned surfaces for the dashboard and doors make the interior particularly premium in both look and appeal. The infotainment system features a touchscreen positioned in the centre of the dashboard, available in different sizes. The traditional analogue dials in front of the driver can also be replaced by a 10.25-inch digital Virtual Cockpit display. Premium features like a heated steering wheel and ambient lighting bring in more up-market tech. Skoda also claims that the Scala's 467-litre boot is the biggest in its segment. Initially, in the international markets, four powertrain options will be offered - two 1.0-litre, three-cylinder petrol motors with power outputs ranging from 94bhp to 113bhp. A more powerful 1.5-litre, four-cylinder petrol motor with 148bhp will round off the petrol line-up. The new hatchback will get a single diesel powertrain option, in the form of a 113bhp, 1.6-litre motor. A 1.0 G-TEC motor delivering 89bhp, designed to run on Compressed Natural Gas (CNG), will follow later in 2019. Skoda has also laid emphasis on making the Scala one of the safest option in its segment by fitting the car with safety tech like lane assist, side assist, autonomous emergency braking, crew protect assist, adaptive cruise control and up to nine airbags. What's more, the Scala can also be bought with full-LED headlights, another first for Skoda.